Club paddling trips take place every week, on Saturdays at 09.30 hours from September until May and at 18.30 and on Tuesdays at 18.30 from May until September. The trips commence at the club facilities in Geldinganes, Reykjavik. 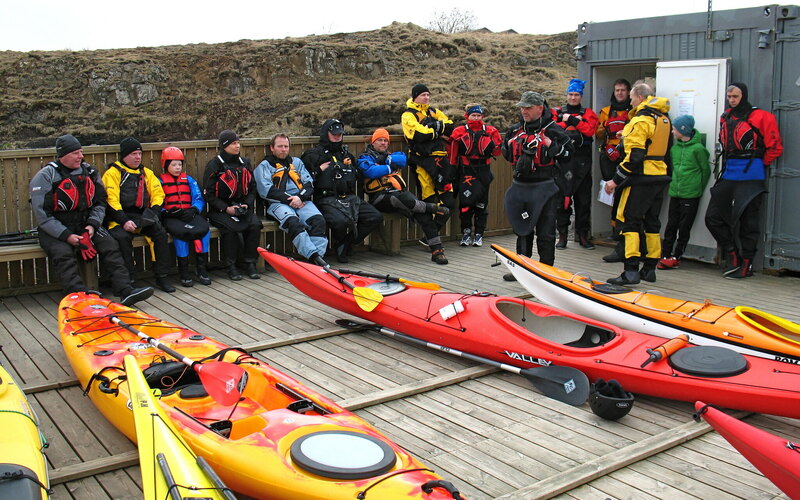 At the onset of each club trip and before the boats are seaborne, the paddling captain(s), approved beforehand by the Club´s Board, should among other tasks take the initiative to speak to new members and assess if they can safely be expected to go out to sea with reference to their capabilities, weather and sea-conditions. Other experienced paddlers who are not paddling captains, should on each occasion also be aware of their general responsibilites towards safety issues. · To introduce themselves and announce plans for the current trip. · Assess the group as regards experience and with regard to general conditions. · Count the number of paddlers/boats at sea. · Choose one paddler to be the rearguard and another to lead the group. · Agree/be aware if the group is split up. · Be in charge on-site when a danger situation emerges. The Club´s Board strongly encourages novice paddlers to have attended a paddling course before their first club trip and to not embark alone for a paddling practice when beginning. The Club´s Board requests novices to consider not to join club paddling trips on their first paddle occasion. The paddling captain should ensure that all novices (who preferably should have joined a relevant new-member club programme) have at least one support individual (liasion member) who watches him/her while paddling. During a trip the captain should continuously and as well as possible evaluate the sea conditions to ascertain that the group will not enter into circumstances which it may be difficult or impossible to control. Experienced club members should not leave the group while the paddling captain considers their support is needed. Anyone leaving the group and choosing more demanding paddle conditions, should do so after informing the paddling captain of the day about their plans. The captain must talk to novices before embarking on the trip to assess their competence with regard to personal safety. It is a definite condition to wear a personal floating device (life-vest) during club trips. The club also places heavy emphasis on wearing suitable and quality garments at sea, such as a dry suit, neoprene head-covering, muffins, to have an extra dry woolen pullover, extra head-covering or gloves. Reference information for novices can be found on the club´s homepage undir „Klúbburinn“ (club) and „Til nýliða“ (to newcomers) (see also ). The club encourages all more experienced paddlers to carry in their boats gear to warm at least two people who have capsized and have gone into water/had to swim. In case of difficult circumstances or the need for rescue maneuvers, the paddling captain conducts the on-site measures, particularly by assigning tasks and entrusting these to the more experience paddlers present. On-site management can involve the call for outside assistance (f.ex. from the general sea and land rescue services) and efforts to avert further problems or accidents. It is recommended that more experienced paddlers should have a towing line, helmet, pump and other similar supportive appliances to cope with difficult situations. The club expects one formal rescue practice to take place half-yearly, after suitable announcements on the web and through other advertizing. These sessions will be particularly aimed at novices who have not practiced sea-rescue. They will be encouraged to try this in order to be better equipped to partake in club paddling activities. Those who oversee the sessions are asked to consider the less experienced in particular. Club members are also encouraged to improve their own skills in this respect at all reasonable opportunities. Everyone who joins a club paddling session does so at his/her own responsibility. The club´s paddling captains shall be actively practising members, have achieved the BCU 4-star level leadership test through attending an approved BCU 4 star leader programme or a comparable other training course.